CONGRATULATIONS to all our newly elected or re-elected Lecturers. Lecturer can be a fun and rewarding job, but it also carries with it a lot of responsibilities. A Lecturer can make or break a Grange. I know we have a lot of talented Lecturers out there. Please use your talents to help our Granges grow. And, if you are not a Lecturer, please remember, everyone needs help once in a while. If you have an idea or are willing to put on a program, please tell your Lecturer. 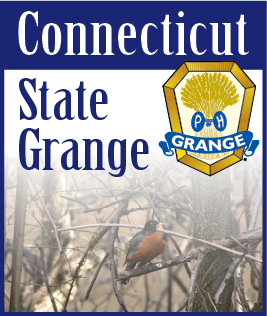 LET'S CELEBRATE will be held this year on July 24th at Cheshire Grange Hall. Several committees are working together to make this a great day for all. Contests will be on display for all to see. With the change of location there should be plenty of room for everything to be seen at its' best. Our PHOTO CONTEST will be a part of the show. The doors will open at 11:00 a.m. Our Juniors will be serving a meatloaf dinner from 12:00 noon until 1:30 p.m. Cost of the dinner will be only $8.00 per person. Sounds like a good deal to me. Entertainment will be by "The Silk City Four, a Barbershop Quartet from Manchester. This part of the day will begin promptly at 2:00 p.m. We will also CELEBRATE New Orleans style. If you have never been to Mardi Gras, be sure and come and catch your very own beads. If you are entering in the CWA contests, Lecturer's Photo Contest or any of the other committee contests your entries must be brought to the hall between 9:00 and 11:00 on Friday, July 23rd. This is new this year, but will enable everything to be set up and ready for judging and display before the hall is opened on Saturday. In the case of the photos, they can be mailed to me or brought to the State Office in Glastonbury a few days ahead of time. Hope to Celebrate with all of you in Cheshire on the 24th.